Back in 2007, I quickly tossed up a YouTube instructional video. It took me about a half hour to make the 4:46 minute video. Today, the video will reach its 2 millionth view. But it’s not a viral video. It’s not hip or trendy. It didn’t get a big spike in viewership and then go away. 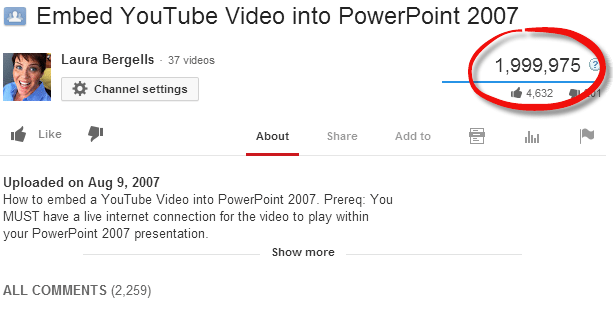 It was meant to be helpful, and at least a few hundred people a day still watch it. And I still receive a ‘thank you’ for posting it almost every day. Those thank-yous have often been real day brighteners for me. Thanks for watching. And thanks to the 4K+ who “liked” it. Thanks to the thousands of friendly commenters — I understand that’s a rarity in YouTube comment land! And thanks to new clients who hired me — just because they “liked my style” or “liked my voice” on the video! Who knew? It’s a different world than it was in 2007. What tiny little thing will you do to today that might quietly ripple into 2020 and beyond?